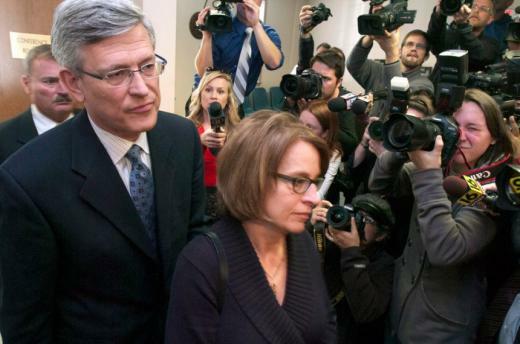 It's a legal setback for three former Penn State leaders facing criminal charges for their roles in the Jerry Sandusky scandal. The judge presiding over the grand jury investigation of Graham Spanier, Tim Curley and Gary Schultz has denied a motion to throw out testimony from Cynthia Baldwin. Judge Barry Feudale issued a 16-page ruling on Tuesday rejecting the defendants’ request to omit Presentment 29 from the investigation. In his ruling, Feudale cited a “jurisdictional issue,” saying that once the supervising judge approves a grand jury Presentment, jurisdiction on trial issues falls under the trial judge. Counsel for Spanier, Curley and Schultz first filed to quash Presentment 29 in Nov. 2012 on the grounds that it relied on testimony from Baldwin, Penn State University’s former general counsel. In January, the defendants’ counsel argued that Baldwin’s testimony was a violation of attorney-client privilege because Baldwin was still serving as general counsel and represented Curley and Schultz in their initial testimonies during the grand jury investigation of Jerry Sandusky. In addition to this, attorneys for Curley and Schultz filed to have the transcript of Baldwin’s testimony and other related documents made public. Judge Feudale, who says that he could be called to testify when the cases go into trial, went on to discuss how he would rule if jurisdiction did fall to him. Citing a “belated awareness of the commission of alleged criminal acts,” Feudale does not believe Baldwin’s testimony violated attorney-client interests, and said he would deny the motions if he did indeed possess the jurisdiction. “This court notes that Spanier, Curley and Schultz are “highly educated” men who had positions of considerable influence at PSU...it therefore strains credulity to infer that they were somehow deluded or misrepresented by attorney Baldwin,” wrote Feudale. Feudale goes on to call the motions as “legal chimeras,” describing them as “imaginative but implausible” claims that only serve to delay the criminal proceedings. The case is now set to move to a preliminary hearing, which will fall under the jurisdiction of Todd Hoover of Dauphin County. Spanier, Curley and Schultz are all facing various charges relating to their handling of allegations of sexual abuse against children by former defensive coordinator Jerry Sandusky. Those charges include perjury, obstruction of justice and endangering the welfare of a child. Ali Fogarty is a staff writer for Onward State and frequent contributor to StateCollege.com. She is a junior at Penn State studying Political Science. 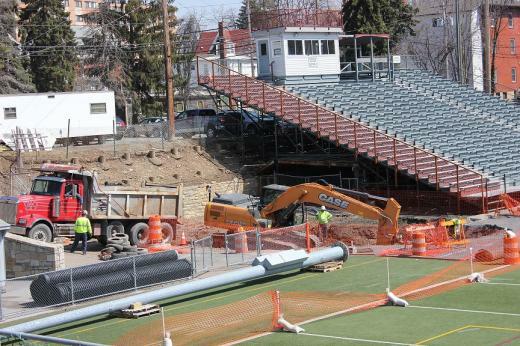 Take a drive down Frazier St. and you'll see construction crews are now working to stabilize a massive sinkhole under the east bleachers of Memorial Field. Ed Poprik is Physical Plant Director for the State College School District. It's Poprik's job to oversee the work. And there's already been one surprise.